CHICAGO — While the numbers weren’t spectacular, all four regions posted year-over-year drycleaning sales gains in October, according to results from this month’s American Drycleaner StatShot survey. The South posted the highest year-over-year gain in October at 3.7%. Coming in next were the Northeast, up 1.7% from October 2014, and the Midwest, up 1.5%. 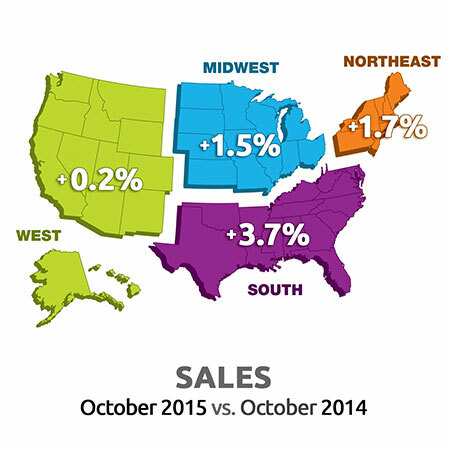 October sales in the West were relatively flat compared to those from the prior October, up just 0.2%. “Sales up, lower fuel and petroleum costs are yielding savings,” writes one respondent from the South. Indeed, utilities cost can have an impact on the bottom line. Dry cleaners were asked how much, if any, their utilities cost had changed between October 2014 and this October. The Northeast reported the biggest increase, 4.0%, on average. In the South, the utilities cost had risen 2.2%. Utilities were virtually flat in the West, rising an average of 0.6% when compared to the prior October. The West was the only region in which dry cleaners reported that the utilities cost had, on average, gone down—by 1.4%. “Utilities are slowly going up, and we are trying to manage usage better and better,” writes a cleaner from the West. The StatShot surveys the drycleaning trade audience every month on a variety of financial issues. While the survey presents a snapshot of market performance, it should not be considered scientific. American Drycleaner audience members are invited via e-mail to participate anonymously in the unscientific surveys, which are conducted online via a partner website. All dry cleaners are encouraged to participate, as a greater number of responses will help to better define industry trends.